June | 2011 | Professional Use Only, No Warranty. 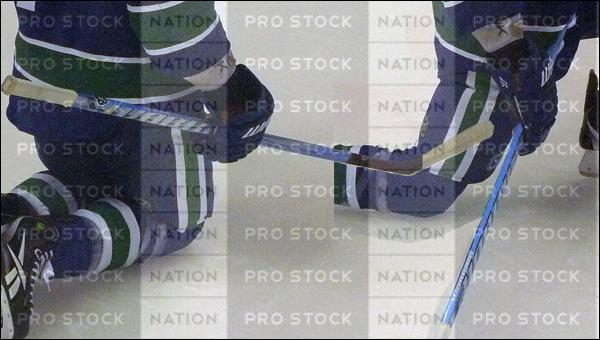 As ProStockNation.com was first to report, the Vancouver Canucks Annual Equipment Sale will be held at the Outlet Store on Hastings starting on July 11, 2011. We are surprised the Canucks have still yet to say anything about this sale online. At their year-end clearance sale today they handed out flyers with a small advertisement on the back regarding the equipment sale. There’s no new information other than some vague price points. Expect the sticks starting at $100 to be at least 4 years old, $100 gloves with no palms left, and the $75 skates to be prehistoric. There usually isn’t anything good until you spend a little more. No early entries for Season Ticket Holders or Email List Members have been released yet but it’s safe to say at this point it will be a free for all once the Outlet doors open at 11am Monday morning. There will be new stock available for sale each day. We have been told only more of certain sticks and goalie equipment have back stock. Everything else such as skates, gloves, etc have been put out on the first day. Since they have been selling equipment year round they will not have as much gear compared to previous years. There is no confirmation from the Canucks yet as to whether or not Season Ticket Holders and/or E-mail list members will have priority entry to the sale or if the Outlet Store hours will change. While our focus has been on pro stock hockey equipment, we also like to showcase goods manufactured in North America. The product we are about to introduce you to (if you haven’t heard of them already) fits our criteria perfectly. First and foremost we would like to thank N from hgreview.ca and BladeTape (BladeTape.ca) for giving us the opportunity to try this product out. BladeTape is made by Blade Pro Sports Products based out of Richmond, BC, Canada. This alternative to traditional stick tape is proudly manufactured in Canada. How BladeTape distinguishes themselves from stick tape begins with the application process. Two rubber-like waffle-patterned strips on an adhesive backing are stuck directly onto the blade; a time-saver. This material is more durable than your conventional tape and it also offers a better grip on the puck. With no tape on the bottom of the blade, friction is reduced as well. Composite sticks are in a day in age where they can endure repeated contact with bare ice quite well so don’t be afraid of excessive wear on the bottom of your blades. I will be using this product on a Sherwood SOP 9950 Goalie Stick (wood and multi-lam construction) so it will be interesting to see how this stick and BladeTape holds up. Willie Mitchell, Chris Mason, Matt Cooke, and Brent Sopel are among some of the NHL players who are BladeTape users as listed on their website. I will be reviewing this over several weeks so I will periodically check in on ProStockNation.com and HGReview.ca. The interesting part is how good of an inventory they have in the .PDF file they uploaded. The prices look very reasonable as well. Share your finds with us if you do happen to go! I went to Game 1 of the 2011 Stanley Cup Final yesterday and I decided to snap a couple pictures during the warmup. Burrows has been using the Widow with the blue LE graphics for quite some time in the post-season now but here’s two shots of it. It’s the same Widow you see in stores right now but they will be coming out with this color in Q4 of 2011. You are currently browsing the Professional Use Only, No Warranty. blog archives for June, 2011.